Welcome to Year 2's page. We have been very busy so far this term. This term's topic is 'Fear Fighters'. We have been having lots of fun exploring how to be brave, heroic and resilient when things get tricky for us or for the characters in the books we have been learning about. Year 2 learnt about a little boy called Orion. In the story, Orion is scared of a lot of things, but most of all he’s scared of the dark. So one night the Dark decides to take Orion on an adventure to conquer his fear. We really enjoyed reading this book and thinking about how we can all be brave like Orion. The children designed and made some fantastic superhero capes. Watch the slideshow below to see a few of their brilliant creations. In response to learning that Orion had tried to invent things to help him see in the dark, we conducted an experiment to see what items were reflective. We turned off the lights and shone torches on different materials to test their visibility. We also thought about wearing reflective materials to stay safe in the dark outside. Click on the gallery below to see the children exploring reflective and non-reflective materials. 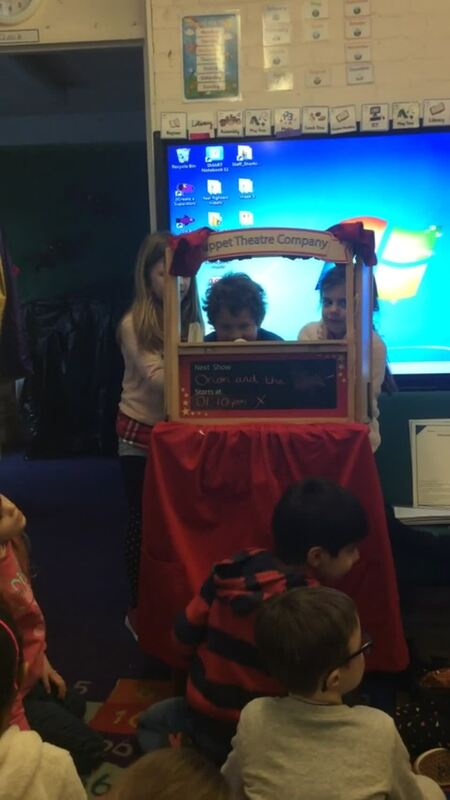 We had lots of fun creating characters from the story and practising our lines for our puppet shows. Click on the video below to watch one of the performances. Year 2 are really enjoying learning about our new character, Halibut Jackson. Halibut is a very shy boy who prefers not to be noticed at all, so he makes himself clothing to match his surroundings. When he is invited to the Queen's party he makes himself a suit of silver and gold to match the palace, thinking it will be the perfect disguise. How was he to know it was a garden party? Much to Halibut's embarrassment he turns everyone's heads when he arrives. However, his suit making skills are admired by all and he no longer wishes to blend in. We really enjoyed reading this book and thinking about how overcoming shyness and embracing our differences makes the world a more interesting and colourful place to be! We have been getting into the mind of Halibut Jackson. We have been thinking about how Halibut might be feeling on the inside and how others view him from the outside. Year 2 has been creating some really descriptive writing to describe the story and Halibut. They have even been working to include noun phrases, questions and conjunctions in their work. Well done, Year 2. To finish our Halibut Jackson topic we enjoyed a trip around our local area. Using our map skills, we explored the human and physical features Brighton's seafront has and how they are different and similar to those found in Halibut's town. The children thoroughly enjoyed the trip which wouldn't have been possible without our parent helpers. Thank you again to those who helped us. In response to the trip, we wrote letters to Halibut Jackson to invite him to come and visit us in Brighton. The children wrote some very persuasive and informative letters about Brighton and really demonstrated the geographical knowledge they had learned through their writing. Some children extended their learning by choosing to write another letter at home! Keep up the great work, Year 2. We have been solving problems involving pounds and pence. We have used our 'more and less than' knowledge to compare amounts of money as well as working with change. Our current topic is 'shape'. We have been exploring the properties of 2D and 3D shapes. The children have enjoyed naming different parts of the shape and using mathematical vocabulary like, vertices and faces. We are currently working on our 2s, 5s and 10s timestables. We have been thinking really hard about how we can be good learners and friends in Year 2. Our new displays help us think about how we are being good learners in our class. Year 2 enjoyed their sleepover party after achieving the goal of earning ten bears. The class were awarded these bears for showing their enthusiastic and positive attitudes towards the classroom and their learning. All of the children worked really hard to achieve this and we are really proud of the effort they gave. We enjoyed relaxing in our pyjamas to watch a movie and eat popcorn. It was a lovely and well earned treat. "I'm glad we got popcorn - it's my favourite!" "I wish we could wear our pyjamas everyday." "My favourite part of the sleepover party was when we watched Aladin. The genie was so funny." Our next Bear Challenge is to earn 15 bears for a disco! We have earned two so far. Keep up the good work, Year 2! We had a wonderful day celebrating our love of books. The children enjoyed a day filled with fun activities such as: bookmark making, writing book reviews and listening to stories in other classrooms. It was great to see so many children and staff dressed up. Everyone looked fantastic!